Akino Miyagi, a committee member of the Nature Conservation Committee of the Lepidopterological Society of Japan, captured on camera three near-threatened species of rare butterflies, on September 25 in Higashi Village, Takae. Takae is near the designated construction area N1, where a helipad is to be relocated as part of the agreement returning a portion of the American military’s Northern Region training area. Miyagi said, “It is unusual to be able to take photos of all three species on the same day,” emphasizing the richness of nature in the area. 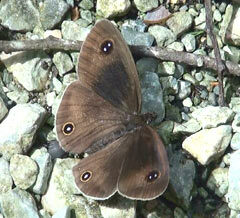 The three species seen near N1 are Ypthima riukiuana, Pithecops corvus ryukyuensis, and Artipe eryx okinawana. 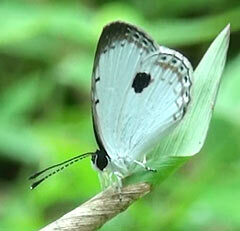 Miyagi confirmed that about 30 individuals of Ypthima riukiuana inhabited the area near N1. This is the first time Ypthima riukiuana has been confirmed near N1. Almost 30 individuals of larval and cocoonal Pithecops corvus ryukyuensis were found near the forest around Arakawa river, which flows in the Takae area. Two helipads have already been constructed in the N4 area around Takae and are likely to be used for training by the the American military. There are also plans for construction of two new helipads at N1. Logging, excavating, and mounding will be carried out during the construction. 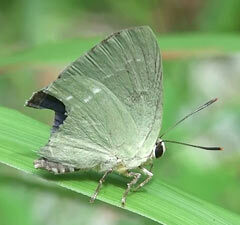 “Takae is a treasure trove of rare butterflies. This might be affected if the forest is destroyed due to construction work,” Miyagi said, expressing concern.